For students to be successful in school, they need to be in school. Nationwide, far too many students are not in school. Missing just two days a month places students at significant increased risk of academic failure, social and behavioral difficulties in school, dropping out, and a host of other negative school and life effects. 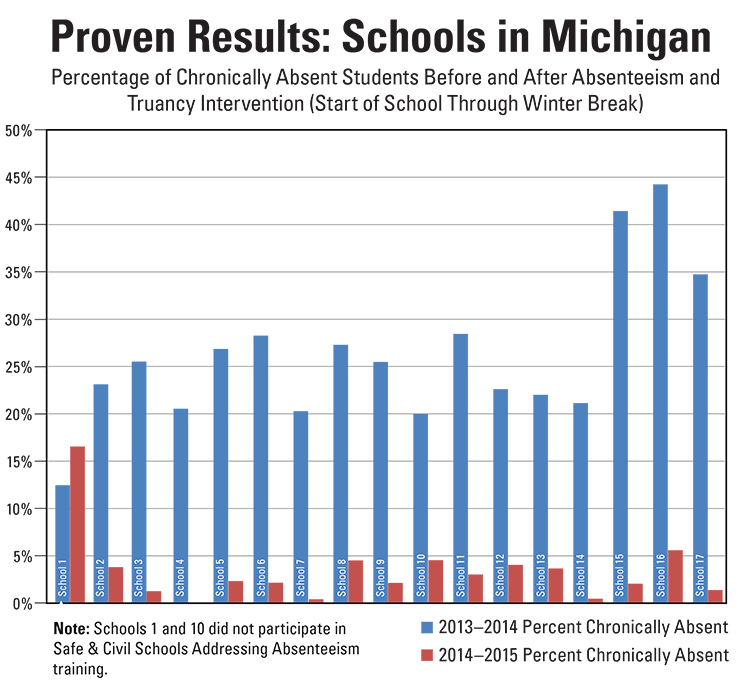 Fifteen pilot schools from districts in Michigan participated in a day of Safe & Civil Schools training in October of 2014 to address chronic absence and truancy. 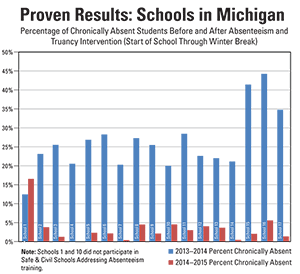 These schools implemented a variety of universal prevention procedures and experienced the following reductions in percent of chronically absent students in the first four months of school. Click on the graph below to enlarge the image. Analyze multiple attendance measures to identify concerns and prioritize resources. Implement simple, practical strategies to prevent widespread absenteeism problems at a universal/schoolwide level. Provide effective intervention in a multi-tiered model, utilizing function-based approaches. Universal prevention�when large numbers of students in your school are missing two or more days each month (10% or more of school), work to reduce the numbers of students who are at risk by focusing on Tier 1 prevention strategies. Function-based assessment and intervention for students who have not responded to universal prevention procedures. This training focuses on identification and intervention with Tier 2 and 3 supports. Combined training across multiple days in universal prevention and function-based intervention. This comprehensive assessment and intervention system is for use with individual students who are chronically absent or truant. Information on the Functional Behavior Assessment of Absenteeism and Truancy system from Ancora Publishing. For more information about professional development from Safe & Civil Schools, call today!